HomeUPSCUPSC CS Prelims Result 2018 Declared, What is next ? UPSC Declared result of civil service exam on 14 July 2018. 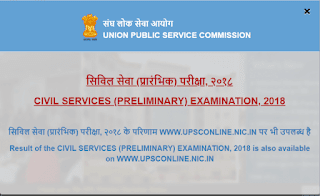 Union Public Service Commission(UPSC) has declared result of Civil Service(CS) Prelims Exam 2018 on 14th July, Candidate can check it here or at official website at upsc.gov.in and upsconline.nic.in. Examination for the same was held on 3rd June 2018. Candidate who qualified prelims exam are allowed for Civil Service Mains Exam. All the qualified candidates are advised to fill up the DAF (CSM) online and submit the same ONLINE for admission to the Civil Services (Main) Examination, 2018 to be held from Friday, 28.09. 2018. The DAF (CSM) will be available on the website of the Commission from 23/07/2018 to 06/08/2018 till 6.00 P.M. Important instructions for filling up of the DAF (CSM) and for submitting the completely filled application form ONLINE to the Commission, would also be available on the website. The candidates who have been declared successful have to first get themselves registered on the relevant page of the website before filling up the ONLINE DAF. The qualified candidates are further advised to refer to the Rules of the Civil Services Examination, 2018 published in the Gazette of India (Extraordinary) of Department of Personnel and Training Notification dated 07.02.2018.